Group Visits at North Norfolk Railway01263 820800work Group VisitsNorfolk's top heritage railway. Steam trains daily April to October. Scenic route along the coast and up through heathlands to Holt. Full size steam engines and vintage carriages. Three great Victorian stations. Special events in summer plus Santa trains December weekends. Lunch and dinner trains. Group sizes - min 20, max 200. Pre-booking required - 7 days in advance. Coach parking free by arrangement, driver incentives, light catering facilities - station buffets, educational pack available, shop. All stations and most trains are accessible. Norfolk's top heritage railway. 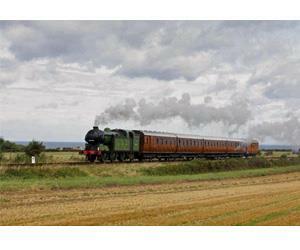 Steam trains daily April to October. Scenic route along the coast and up through heathlands to Holt. Full size steam engines and vintage carriages. Three great Victorian stations. Special events in summer plus Santa trains December weekends. Lunch and dinner trains. Please call for 2014 prices.